From November, the US gets into the holiday mood with people flocking into their favorite online stores trying to get their best deals. Not just for customers, but it’s the most busiest and important part of the year for the retailers where you’re looking forward to make more sales and increase your customer base. With only two weeks left for Black Friday and Cyber Monday, is your website ready to handle the last minute holiday chaos? In 2015, shoppers spent $4.45 billion on Black Friday and Thanksgiving Day. Customers are expected to spend a lot more this year. So, it’s upto you to ensure that you deliver top notch shopping experience to customers this holiday season, otherwise you will miss out to competitors. 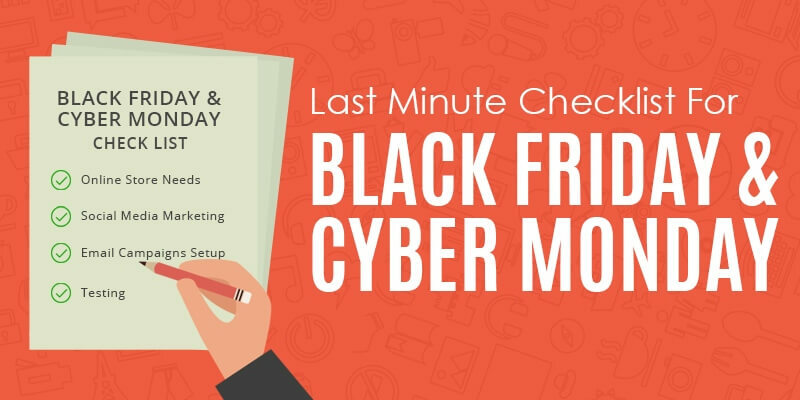 With not much time left, here’s a last minute checklist to help you prepare your store and make some smooth as well as record breaking sales this Black Friday and Cyber Monday. When customers visit your website, make sure you give them the feel of your latest deals and all that your store has for Black Friday and Cyber Monday sales. Remember to take them to your Thanksgiving Weekend Sales landing page where customers can get an overview of what is in stock for them. Add banners, pop ups and relevant CTAs or even a countdown timer just to spice up the Black Friday and Cyber Monday online events. It’s easy to lose potential customers on special days this holiday season if your online store takes even more than 3 seconds to load. Work on your high resolution images. You could either compress or resize them. Using tools like G-Zip, you can relatively compress your page size. Take the help of Google Insights, Pingdom and GTmetrix. Using these tools, it’s possible to extract all metrics like compression rates, loading speed and time etc. The ‘Yslow score’ metric in GTmetrix can also give you insights on the different parameters that slow down your website. Don’t forget to test your server load capacity and find out if your website is strong enough to handle the traffic influx. Help your customers easily checkout their products thisBlack Friday and Cyber Monday without having to fill long and unending forms. Make sure you have integrated all major payment gateways so that customers don’t leave your cart half way through. Avoid giving them unpleasant surprises by differing your prices at each checkout level. If possible, offer free shipments and include some gifts/offers to get more sales. Assist your customers when they are shopping on your site. Customers sometimes need immediate assistance and while they are searching your site for products, you should engage with them in assisting their needs. Make sure you test and get standardized tools that will help you stay around for your customers during the Black Friday and Cyber Monday rush. Admit it. Customers love the holiday season because of the biggest deals, offers, gifts and other freebies that you could be giving them. But wonder what happens when they can’t use their coupons for special discounts? You lose sales. Ensure your discount codes work and your loyal customers are treated extra special so that they don’t forget your Thanksgiving Weekend deals for them. It will be best if you have specific deals and offers for your loyal customers and new customers. You can provide referral offers, offers based on the cart volume, location, social shares etc. This ways you attract different categories and end up making more sales. Make Design test cases for your code libraries and make sure to figure out the active and expired deals. Remember, don’t mess up with your offer codes or create new ones. Now is not the time to try new offer codes. Build scarcity and urgency in your promotional content. ‘Limited offers’ along with ‘exclusive’ deals spark a sense of urgency for customers to buy your product without much thought. Social media can be your last minute savior to bring out your Thanksgiving, Black Friday and Cyber Monday sales. Make sure you have a dedicated team to monitor and actively post your Thanksgiving offers and other news. You could also consult media partners, send out frequent mailers, schedule tweets with relevant hashtags (use tools like buzzsumo to identify trends) and start engaging with customers. Facebook and Twitter will allow you to create targeted social media campaigns which help customers find your Black Friday and Cyber Monday deals easily. Retargeting your ads to customers can be another effective technique to remind them about offers that you have. Create fresh, creative Ad copies or you could even get the help of Facebook Ads to promote your Thanksgiving weekend offers easily. By now, you should have already segmented your email database based on customer preferences, previously purchased items, favorites added to carts etc. If you know these details it will be easy for you to send out personalized emails that will help them complete their purchase. This is another way to control cart abandonment rates. When customers find special deals attached to their products already added in their shopping cart, they can’t have any more reasons to not buy them. Test your personalization tools and ensure they work great for your Black Friday and Cyber Monday campaigns. No matter what, don’t stop testing all that you’ve implemented and integrated. Rigorous testing is the key to successful sales. Perform A/B testing on each aspect of your store like shipment, promo codes, search options, navigations, payment, product image visibility, SEO strength, etc. Make sure your site is mobile friendly. Consider having a backup plan for ensuring you don’t get to panic. Stock up. It’s not good to lose potential customers just because you went out of stock during busy online days like Cyber Monday. Once you’re done with end to end testing, don’t forget to track your progress. Set up eCommerce tracking in your Google Analytics. This helps you study your customer’s buying behavior and tweak your campaigns or selling patterns.You get to know if you’re running out of stock, have an accurate measure of your customer preferences, traffic, referrals etc. This is because numbers are extremely important to scale your business in the right direction without being blindsided by guesses. The holiday season is the best time to setup analytics as the excess traffic provides invaluable data on how customers use your site. It will take anything between 2-3 times the time period to collect this much data during the regular season. There’d be just one thing on your mind during each holiday season – Make maximum sales!It’s not really possible to reach out to all your processes and departments and ensure they’re working fine.But when you have a dedicated maintenance and support team, you can relax. This is because there are high chances that you could encounter plenty of last minute surprises, like, site crashes (the biggest of all nightmares). Your maintenance and support team will ensure that your site is safe from hackers and other website outages round the clock. Thinking of hiring our maintenance and support experts to ensure you don’t miss out a single sale on this Thanksgiving? We’re just a call away!